Faster than I ever could have expected, we can now begin pre-orders for the Complete Picatrix! There are four different versions, leatherbound, clothbound and print on demand hardcovers and paperbacks. You will be among a select few to have the first copies of this occult classic, available now in a clear and intelligible, beautiful and usable translation. All pre-orders get the special bonus pdfs, including Heydon's "Astrology: Wisdom of Solomon" (London 1792) 234 pages, "The art of determining future events by the only true method the radical figure of birth" including "A curious collection of Nativities"; an article "Ibn Washiyya and Magic" on the Nabatean Agriculture, a key esoteric text heavily excerpted in Picatrix; David Pingree's article, "Some of the Sources of the Ghayat al Hikam" on the sources of Picatrix; and Boulton's "Complete History of Magick, Sorcery and Witchcraft" (London, 1715) 294 pages. The Picatrix Astrological Magic Course Upgrade is also available for current students of the Astrological Magic Course. You get a free copy of either the Lulu print on demand paperback or hardcover Complete Picatrix plus a new Course CD. The Astrological Magic Course has been updated to fully integrate the Picatrix into the lessons, plus updated talisman examples, plus ten academic articles on Picatrix and astrological magic with every article cited in the Complete Picatrix bibliography, plus a new lesson, Robert Zoller: The Secret Instructions, which includes secret teachings passed on to me by my magical master, Robert Zoller. The upgrade is free to current students who order the clothbound or leatherbound complete Picatrix. You can also enroll as a new Astrological Magic Course student and get the free paperback Picatrix and upgraded course CD. 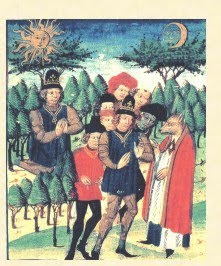 The paperback Complete Picatrix replaces the Secrets of Planetary Ritual as a free course text. students & pre-order bonus pdfs. More information on the leatherbound Picatrix. The text for all four versions is the same, but the leatherbound, clothbound and lulu editions all have different layout, fonts and illustrations. All editions include extensive introduction, over 400 footnotes, glossary, bibliography and index. The leatherbound and clothbound editions are handmade and custom made to order. You can have your name or the name of your choice listed in the leather or clothbound versions. The leatherbound version can be consecrated to the 7 planets on request. The cloth bound versions come in planetary series limited editions for each of the 7 planets and can be consecrated to the planet of their series on request. Pre-orders of lulu paperbacks and hardcovers will be sent to the printer for fulfillment and shipping, paperbacks are typically printing within less than a week, hardcovers, less than two weeks. Shipping can take a week. Astrological Magic Course CDs may need to be shipped separately from Complete Picatrix orders, but the cost is the same. Cloth and leatherbound versions can take up to 30 days. 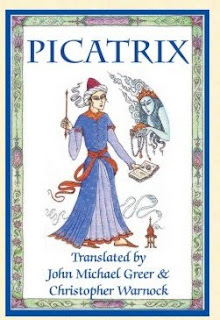 In getting ready for the Picatrix launch, I was idly searching and popped up a few pages on Picatrix in a book I had never heard of, Grimoires: A History of Magic Books by Owen Davies. Davies is an English academic who wrote another book I enjoyed, Popular Magic: Cunning-folk in English History. So I thought, what the heck! Get a used copy and read about Picatrix. Well, I was very surprised because "Grimoires", while it is a very good survey of magical books in the West from the Middle Ages to the present, actually is much more, the best one book study of esotericism in the West I have yet seen. I was particularly taken by the incredible notoriety of DeLaurence, who I'd always taken as a plagiarist and publisher of pulp [Davies has a whole chapter called Pulp Magic!] 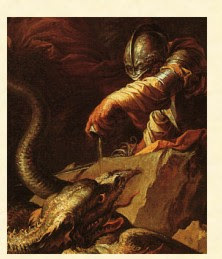 In South America, in the Caribbean and especially in Jamaica, DeLaurence became notorious and the possession of his "Sixth and Seventh Books of Moses" the key to magical credibility. Amazingly enough I encountered this personally recently. I shipped a talisman to Jamaica recently and of course included my usual instruction booklet. The talisman was confiscated by Jamaican Customs! When I checked the Jamaican Customs regulations I found that there was no restriction on jewelry, but that magic books published by DeLaurence were specifically banned in Jamaica. What a synchronicity! Particularly since Davies mentions the Jamaican Customs regulations in his book. So we have everything, King Solomon, Greek Magical Papyri, Hermes Trismegistus, Picatrix, Ficino, Agrippa, Key of Solomon, 17th & 18th century Europe and America, Petit Albert, Red Dragon, 6th, 7th, 8th, 9th and 10th Books of Moses, Freemasonry, Joseph Smith, Voudun, Santeria, Allen Kardac, Hoodoo, Paschal Beverly Randolph, the Golden Dawn, Crowely, Necronomicon, Anton Levey, Gardner and Wicca. All the disparate strands of Western esotericism, all connected by grimoires! I'm reading this and saying, "Why haven't I heard of this book before?" Well it was only published in 2009. Excellent, really excellent! This is exactly what an academic study is useful for, placing things in historical perspective. Definitely extremely useful and worth getting! 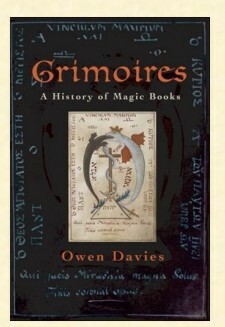 Here is a link to Amazon for Grimoires by Davies. I had a question asked recently about images of the planets in all their dignities and debilities to be used for meditation and contemplation. The easy answer is that we have a lot of image descriptions, but not a lot of actual images. 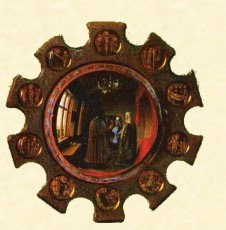 Basically we have woodblock images of the 360 degrees and 36 faces from Johannes Angelus, the incomplete face/decan murals in the Schifanoia Palace, some cartoonish images in Pingree's Latin Picatrix and Nigel's work. In addition, the concept of doing planets in signs and as a meditation is not how our traditional sources worked. Firstly they are generally doing images in order to create talismans, that is to say, in order to invoke a particular astrological spirit or spirits. This could be for practical, magical purposes or more devotional, but in either case they were thinking more about the requirements of an external spirit, rather than internal meditation. The only explicitly meditative image I know of is from Ficino's Three Books on Life where he discusses construction of a model of the Cosmos, either as a sort of armillary sphere or as a painting on the inside of the walls and ceiling of a room, "You will, however, fashion a better image within yourself..." Three Books on Life Bk III, ch 19 Kaske & Clarke, p 347. Three Books of Occult Philosophy Bk II, ch 41. But as far as the planets in the debilities, there are a couple of problems. First in terms of talismans, these are curse talismans, like the Rats Begone! Talisman. This accounts for why our sources don't even list images for say Saturn or Mars in detriment. Going further with this, the image of Saturn in detriment would not be something that you would want to consecrate and thus energize and ensoul since it would start putting out negative vibes. Indeed, Picatrix, after discussing an image of Saturn for discord, made when in his hour, when he is rising, thus not even afflicted, says, "Be careful not to carry this image with you." Picatrix Bk II, ch 10, Greer & Warnock, Complete Picatrix, page 106. True speech, hope, blackness, age, buildings, fear, great thoughts, cares, angers, betrayals, sorrows, anguish, death, inheritances, orphans, old places, appraisals, proper elocution, secret sciences, secret meanings, and profound knowledge: he signifies all the foregoing when he is direct in his motion. When he is retrograde, however, he signifies misfortune, debilities or infirmities, prisons and evils suffered in all things, and if he enters into aspect with any other planet, he weakens it and damages all the qualities of the other planet. If he is retrograde and you ask him for something, what you seek will come about with delays and miseries and great labor. If he is retrograde in any of his dignities, his maledictions are augmented and increased; while if he rises in his powers and dignities, then he will be easier and gentler. Picatrix, Bk III, ch 7. This reminds me of a decision I made awhile back with regard to psychological profiling. I found this to be an interesting and unusual modern method of synthetic reasoning, most typically used for tracking serial killers by trying to understand their psychology and motivations, to get into their heads. Having had just the slightest exposure I realized that I would be exposing myself to the most negative possible influences, what medievals would rightly consider demonic, and that was not a good idea! It is too easy to fool oneself into thinking that this is study, when it is in fact stirring up evil, both internally and externally. And ultimately, this is a problem with curses and malefic magic. While the ostensible focus is external, the mage cannot help but be affected by the forces they are invoking. Look at what happened to me with the rat talisman. I am not advocating that we be ignorant of evil, or that malefic energy and malefic planets should be forbidden and beyond the pale. But as the Centiloquium attributed to Ptolemy so rightly says, the malefics are like poisons, and while capable of being used for healing, we must still remember that they are dangerous. The idea of meditating on the planets in all of their dignities and debilities is an interesting one, reminiscent of Ficino's Cosmos image, but we need to have a healthy respect for spiritual energy, both benefic and malefic and realize that we are connected to, and affected by, everything that we see, do and think. An image for enduring love. 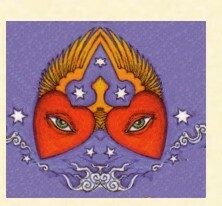 Make two images, and put one of the Fortunes at the ascendant and the Moon in Taurus conjunct Venus. Write on one image a number – that is, a figure of al-Khwarismi, the sort that begin with 0 -- for 220 in the proper place, and on the other image write the same kind of figure for 284 in the proper place. Join the two figures together in an embrace, and then there will be perfect and lasting love between the two. These are amicable numbers because 220 is evenly divided by 1, 2, 4, 5, 10, 11, 20, 22, 44, 55 and 110, but if you add all these numbers together you get 284; and 284 is evenly divided by 1, 2, 4, 71, and 142, which if you add altogether you get 220. Thus these numbers have a very close and intimate relationship, they create each other! The one who first compounded this stone by his own labor was King Behentater, who was one of the kings of India, and a great sage. It was he who built the city of Manif, in which he built mighty buildings, and in those buildings constructed images that spoke. He it was who discovered how to use numbers to make computations for love, which is one of the great wonders the Hindus have. When two people were given these numbers in food or drink or in any other manner, they became great friends and well pleasing to each other. If the aforesaid numbers were carved in wood, and bread or anything else edible was sealed with them and you gave it to someone to eat, he will delight in you with a great love. If those numbers are written on your clothing, your garments cannot be taken away from you; and if you write them on banners that are put in the street to draw business, they will draw business to you. The lesser of these numbers is 220, and the greater is 284. The way to use these numbers is as follows. Write the smaller and the larger number in the figures of al-Khwarismi. Give the lesser in food to whomever you wish; you should eat the larger. The one who receives the smaller will be obedient to you as the lesser is obedient to the greater, and you will be delighted by him because of the marvelous property and power of the aforesaid computations. These computations may be done similarly with raisins, and pomegranate seeds, and eating whatever other fruit you wish. This is done by the number, and not by the figure. I have experienced the aforesaid computations many times, and have found truth in them as narrated above. Picatrix, Bk III, ch 11. Nowadays amicable numbers are just an odd number coincidence, an amusement for elementary math students. But let's look at the cast of characters associated with amicable numbers. Iamblichus, the foremost Neoplatonic adherent of theurgy, divine magic, attributed these very amicable numbers to Pythagoras, Thabit Ibn Qurra, author of De Imaginibus, found an algorithm for discovering amicable numbers, al-Majriti, possible author of Picatrix, is also associated with amicable numbers. But why did they bother? Picatrix explains to us, " Magic is difficult to understand because it uses connections hidden from our senses and our sight. This is because these connections are divine powers placed before things to lure them upwards...By sages magical images are called talismans...To work victoriously he makes [talismans] with mathematical proportions and influences and uses celestial writing." Picatrix Bk I, ch 2. While in one sense astrology depends on mathematics because of the calculations necessary to plot the position of celestial bodies, in a deeper sense astrology and astrological magic work because of the spiritual correspondence and sympathy of all things, which can be seen quite clearly in mathematical ratios and relationships. Here the amicable numbers, perfectly acceptable mathematically to moderns, fascinated our illustrious predecessors who discerned the true magical nature of reality though the relationship, which they saw as love, between these numbers. Once the underlying relationship is seen, the practical magical and talismanic use becomes obvious! What treasures await us in Picatrix! What knowledge so long hidden, lost for three centuries, is soon to be revealed to us! I got what I call a rabbit hole question asking me about house protection talismans. It seems like a small question, but when you explore it it keeps expanding. "said gives grace in causes, brings peace to houses in which it is, preserves its bearer always from harm and removes discords." 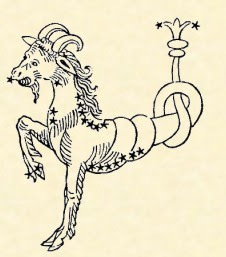 "Under the tail of Capricorn they made the image of an Hart, or Goate, or of an angryman; it bestoweth prosperity, and increaseth wrath." "..imaginem cervi vel hirci vel hominis irati dat prosperitatem et auget divitas"
The image of a stag or he-goat or angry man which gives prosperity and augments prosperity [alternatively lengthens life]." Three Books of Occult Philosophy Bk II, chapter 47, ed Compagni (Brill 1992) page 367. As is typical, whenever there is confusion it is in the JF translation, not the original Latin. So, Deneb Algedi it is! But perhaps we can do something extra here, a combo fixed star/house based talisman? Here is an interesting election for this talisman, 1:05-1:30 am CDT, August 14, 2010 for Iowa City, IA. We have Deneb Algedi culminating, right on the Midheaven at around 1:18 am CDT at 23 Aquarius, with some space on either side to start and stop making the talisman and doing the consecration. The Moon trines Deneb Algedi and in this case we throw in the Ascendant ruler Mercury who is dignified by sign and exalted (I don't give Mercury in Virgo full sign + full exaltation dignity, he seems more like +6 or +7 really). He is in the 4th house of the home, though nearing the end. The 4th ruler of the house is the Sun dignified by sign and the Moon also sextiles the Sun. Nice! So, thanks for the question, I really started falling down the rabbit hole on that one. Due to our busy August casting schedule we can't cast silver talismans on that date, but we will cast Deneb Algedi talismans in September! If I get enough interest, e-mail me at chriswarnock@renaissanceastrology.com I will make small Deneb Algedi mirrors either at this August election or in September. Cost would be $69.95 plus shipping. Of course you can always make your own talismans, adjusting the election to your location using a chart, not time zone adjustment. Put the sigil of Deneb Algedi on it, plus the Sun and Mercury and invoke the spirits of this star and planets. 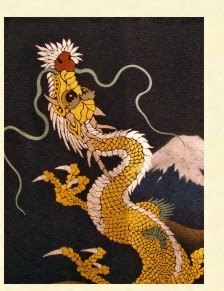 The Head of the Dragon is a benefic. Its nature is composed of the nature of Jupiter and Venus. It indicates rulership, good fortune and property. Some say its nature is to increase. If it is with the benefics it increases their good fortune; if it is with the malefics it increases their bad fortune...The Tail of the Dragon is a malefic. Its nature is composed from the nature of Saturn and Mars. It indicates lowness, falling and poverty. Some said its nature is decrease. If it is with the benefics it decreases their good fortune; if it is with the malefics it decreases their bad fortune. Thus it is said that the Head is a benefic with the benefics and a malefic with the malefics; the Tail is a malefic with the benefics and the benefic with the malefics. Sections 45-8, Chapter 2, The Introduction to Astrology, tr. Burnett, Yamamoto (Warburg, 2004) pages 88-9. Very interesting! Even Al-Qabisi was using the Head = good, Tail = bad that the 17th century astrologers use, but he explains the alternate division of growth and decrease. This is another example of how much more nuanced traditional astrology is, particularly the early Arabic variety. Chap. xlv. Of the Images of the head and Tayle of the Dragon of the Moon. But they made the Image of the taile like as when the Moon Ecclipsed, in the Taile, or ill affected by Saturn or Mars, and they made it to introduce, anguish, infirmity and misfortune; and they called it the evill Genius; such an Image a certain Hebrew had included in a golden Belt full of Jewels, which Blanch the daughter of the Duke of Borbon (either willingly or ignorantly) bestowed on her husband Peter King of Spain, the first of that name, with which when he was girt, he seemed to himself to be compassed about with a Serpent; and afterwards finding the Magicall virtue fixed in the girdle, for this cause he forsook his wife. Three Books of Occult Philosophy Bk II, ch 45. I had a poster ask me about using or wearing multiple talismans. A very good question and one that comes up frequently. We don't have any guidance in our traditional sources on astrological talismans with regard to the interaction of multiple talismans. This is my take, based on my personal experience and personal logic. I used to be worried about combining talismans of planets that were inimical to each other. There are variant traditional lists of which planets are friends with each other and enemies to each other. However, I personally wear a Saturn ring on my right hand and Sun ring on my left with other pendants, at the moment a Jupiter in Pisces, plus Regulus and Alkaid. I have never noticed any interaction problems. I have three altars, a planetary altar, Mansions of the Moon altar and fixed stars altar. I have lots of different astrological talismans and mirrors on these altars and again, seemingly no interaction problems. Now each planet, fixed star or Mansions has their own special place and their own image on the altar. Just like in the Heavens each one has his own orbit, area or sphere. The planets get along fine in the Heavens, so if that placement is replicated on Earth, they seem to get along fine here too. These talismans are the ensouled spirits of the planets, fixed stars or Mansions, respect and honor them and you are fine! This is not to say that there might not be situations where there are negative interactions, but I have not personally experienced this given the parameters I have laid out above. Note that this "getting along" is just among astrological spirits, not any and all magical talismans of whatever source or power and certainly not of non-astrological spirits. Different spirits, be they Goetic or from a different tradition, like Santeria, are a whole different story and should not be mixed willy nilly. Similarly, I would not be shocked if others had astrological talismans interaction problems, but so far I haven't and haven't had specific instances reported to me. Boy, it just doesn't stop with the sidereal[sic] onslaught. I had a poster quoting my Mansions webpage about the Sun and the ecliptic being like the Moon in her Mansions and demanding to know how I could use the Tropical Mansions. Too bad they didn't bother to read the next section! This raises a bigger point however. Part of the problem with the onslaught of the sidereal[sic] Zodiac is that it obscures thinking about the question of choice of Tropical versus Constellational placement of various astrological factors. Traditional astrologers used the Tropical Zodiac which is oriented to the seasons, but they did precess fixed stars, how about that? This is just more ammunition for a general attack on the use of the Tropical Zodiac if we don't think carefully about it. Let's think about Arabic Parts for a second. Arabic Parts, the most famous being the Part of Fortune, do not represent actual, material bodies. They are derived from the Zodiacal longitude of 3 points, often the distance from one planet to another then projected from another point. For example the Part of Fortune is the distance from the Sun to the Moon or Moon to the Sun, depending on whether it is day or night [I've probably got those switched, but this example doesn't depend on it] projected from the Ascendant. But, what's going on here? Where are the beams, rays or fields from something "actual" that MUST be causing astrological effects. Whoops! There aren't any. What we are seeing is that the Arabic Parts expose the deep patterning and unity of the Cosmos, rather than the "actual" position of a material body. Let's think about the fixed stars again. Yes, traditional astrologers do precess their Zodiacal longitude, but unlike the planets who are all basically orbiting in the path of the Sun, the ecliptic, the fixed stars are placed all over the 3D sphere of the Heavens. We project them from this 3D "actual" position on to the flat 2D Zodiac thus severely distorting their position unless they happen to be placed near the ecliptic. But the traditional method of fixed stars works! They actually accurate predict and ensoul talismans even though their "actual" position is not being used. How can this be? In point of fact, like the Arabic Parts, the fixed stars are revealing deep underlying patternings, not apparent from their "actual" placement. Crazy to the atheistic/materialist, but just plain common sense to the Hermetic/Neoplatonist!